For CleanTechnica readers not based in the US or unfamiliar with the US presidential election process, there is an odd system that is used that is not a simple one-person-one-vote system. Electoral College (EC) electors are used to represent the states. The number of electors are distributed unevenly, giving low populous states more votes than high populous states. This is an anachronistic holdover from a couple of centuries ago when newspapers were delivered by horse power … the old, original form of horsepower. The impact of this system is that five presidents in the last 240 years have become president when they were not elected by the people, but were rather selected by the Electoral College. The most recent presidents elected this way were George W. Bush in the 2000 race when Al Gore beat him by 400,000 citizen votes and Donald Trump in 2016 when Hillary Clinton beat him by 2,800,000 votes. Why is this of significance to CleanTechnica? Because the impact of the Electoral College has been the election of oil, coal, gas, and nuclear candidates instead of renewable energy candidates. Besides, we are sort of fond of democracy, equality, and fairness here at CleanTechnica. “You shouldn’t have to say the obvious, that the data is unforgiving, no matter what the deniers try to assert. Sea levels are rising. Ice caps are melting. Storms, droughts, and wildfires are wreaking havoc. Thirteen of the top fourteen warmest years have all come since 2000. And this July, scientists found levels of carbon dioxide in our atmosphere not seen in millions of years. So the threat is real. What is the Problem Using the Electoral College? The issue with the Electoral College isn’t just that the “one person, one vote” concept is violated by it, but to be more clear, it’s that even “one person, one vote” within the voting jurisdiction of the election is violated. Here’s an explanation via example: during a Nevada gubernatorial race, Nevada is the jurisdiction, so to have Las Vegas votes count more than Reno votes would be unfair and would never be tolerated. The same principle holds true for a presidential race, wherein the jurisdiction is the nation, so to have Vermont votes count more than Texan votes should likewise not be tolerated. However, with the Electoral College, Vermont votes do count more than votes from Texas. Below is a short video (7 minutes) that explains the problem in more detail. Besides, it’s sort of fun for political nerds, and anyone still reading eight paragraphs into this article is one. There’s a group of clever people who figured out a way to effectively nullify the Electoral College, so that presidential candidates would be elected by a simple democratic election. The National Popular Vote is led by John Koza, PhD, and attorney Barry Fadem. First, they needed a solution that worked within the constraints of the U.S. Constitution, where the Electoral College is put forth. The NPV bills are fully congruous with the US Constitution in that the Constitution grants states the right to determine how their Electoral College votes are cast. Since these are state bills, the Constitution is satisfied and not violated. The way these state National Popular Vote Acts works is simple. Each state enters a compact (contract) with the other states that have passed a similar bill, whereby they agree to pledge all of their EC votes to the presidential candidate who wins the popular vote. After the compact is signed into law, nothing changes until there are enough states that have signed on to get the group of states to 270 Electoral College votes, which is the count of EC votes needed to elect a president. Once enough states are on board, each state will then commence with this process of pledging their EC votes for the candidate who wins the popular vote. For more, below is my personal testimony in Nevada a couple of weeks ago. My name is Daryl Elliott. I’d like to thank Assemblyperson Tyrone Thompson, and the sponsors, and co-sponsors, for putting forth Nevada bill AB186 to effectively end the undemocratic Electoral College. I urge passage of this bill, which would enter Nevada into a compact with the 12 states that have already passed similar bills. The total pledged Electoral College votes from these 12 states is 172, which leaves only 98 more pledged votes needed before the Electoral College will end its undemocratic tyranny over the promise of American democracy. Democracy is based on the simple principle of one person’s vote counting the same as all other citizens’ votes. The Electoral College violates this most basic of democratic principles. This bill is fully congruous with the US Constitution in that the Constitution grants states the right to determine how their Electoral College votes are cast. It is imperative that Nevada legislators act now to enact this bill so Governor Sisolak may sign it well before the next Presidential election. It is urgent that Nevadans do our part to prevent another Presidential candidate from ascending to the Presidency after losing the popular vote, which has happened twice in the last two decades. It is time the Nevada legislature acts to end this anachronistic practice by pledging our six Electoral College votes to the Presidential candidate who wins the popular vote. 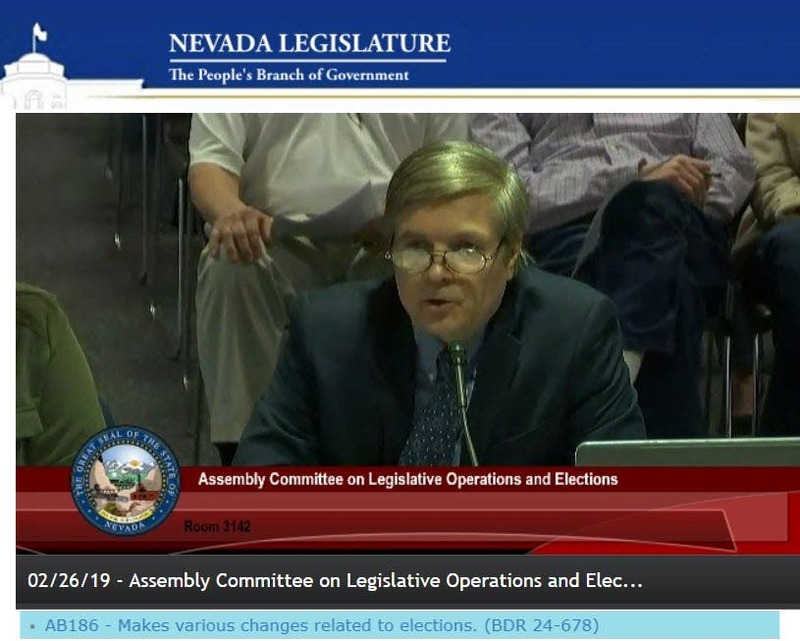 Testimony by Daryl Elliott to the Nevada State Legislature on the National Popular Vote Act. Credit: Nevada State Legislature video screenshot. There are 12 states representing 172 electoral votes (CA, CT, DC, HI, IL, MA, MD, NJ, NY, RI, VT, WA) that have already passed the National Popular Vote Act. Whereas there are 270 Electoral College votes needed to elect a president, this means that we are 63% of the way there to effectively end the Electoral College. If you are from the US and support our efforts to allow for a one-person-one-vote democracy in electing the president, you can use the applet at the National Popular Vote campaign website (on the right side of the page) to contact your state legislators. It should be noted that there is federal legislation that has been filed to end the Electoral College entirely. It’s not expected to pass during this session of Congress. Article on Steve Cohen’s proposed legislation that would eliminate the EC and prevent presidents from pardoning themselves or their family members. This is not likely to pass, and even if it did, it would have to be ratified by two thirds of the states since these are changes to the U.S. Constitution. This is the text of the legislation to eliminate the Electoral College. What do you think? Do you like or dislike the idea of eliminating the Electoral College, either effectively through the National Popular Vote Act legislation or through a change in the U.S. Constitution?